What’s not to Love about an Oak Savanna? Craig Maier enjoys exploring and learning about remnant prairies and oak savannas wherever they might be found, from roadsides to farms to State natural areas so he’ll have plenty of information to share. He is the Coordinator of The Tallgrass Prairie and Oak Savanna Fire Science Consortium, a network that thrives on accelerating the awareness, understanding and adoption of fire science across the Upper Midwest. Photo courtesy of Craig Maier. Wisconsin historian Reuben Gold Thwaites (1853-1913) once wrote that one of the first men who came to this territory wrote that our area had “a scattering of giant oaks with a carpet of wildflowers beneath.” Wildlife like bobwhite quail, native bees, wild turkeys, whippoorwills, redheaded woodpeckers and many other critters find their niches in these open, sunny oak ecosystems. Open, bright and buzzing with life–what’s not to love about an oak savanna? Or a woodland? If you’re going to be in Wisconsin on January 28th, plan to attend this year’s Toward Harmony with Nature natural landscaping conference in Oshkosh to hear Craig Maier’s introduction to oak savannas and woodlands. He’ll help us identify and strategize for the development and restoration of these awesome native plant communities. The rewards for those who are planting savannas and woodlands on former farmlands typically are healthier soils, cleaner water, outstanding wildflower displays and a greater number of wildlife visitors. What is an oak savanna? A savanna is an ecosystem historically situated between a prairie a forest. It was that transition zone from prairie to forest. Oaks were typically the dominant trees, because their thick, rough bark could withstand fire. Occasionally, one would also see Shag Bark Hickory. Today, oak savannas are among the rarest natural communities in Wisconsin. While clearing has led to substantial loss of oak groves, there are still examples of these ecosystems hiding in the shadows of native forest trees and often in exotic shrubs. An example of a local Fox Valley savanna remnant is on the UW Oshkosh campus in the Fredric March Theater/Fine Arts Building area. 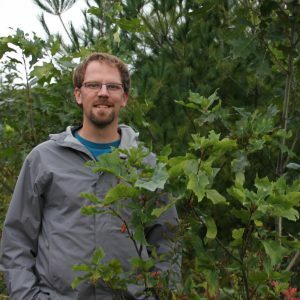 Plan to join us to hear Maier and ten other speakers at the Wild Ones Fox Valley Area’s 21st annual natural landscaping conference Toward Harmony with Nature and learn more about life in the natural landscape. But if you can’t, do include oak in your native plantings. For more information about the conference and to register. See also Doug Tallamy’s Native Caterpillars, Moths and Butterflies, and Host Native Woodies to learn more about the value of oaks to wildlife.